After Dakota Access Pipeline Protests, Army Corps Blocks Final Permit, Will Explore Other Routes : The Two-Way The Army Corps of Engineers says it's denying a permit for building the oil pipeline right above the Standing Rock Sioux Reservation. The move comes after months of protests. Protesters celebrate at Oceti Sakowin Camp earlier Sunday. The Army Corps of Engineers notified the Standing Rock Sioux that the current route for the Dakota Access Pipeline will be denied. Jo-Ellen Darcy, the Army's assistant secretary for civil works, said after talking with tribal officials and hearing their concerns that the pipeline could affect the drinking water, it became "clear that there's more work to do." "The best way to complete that work responsibly and expeditiously is to explore alternate routes for the pipeline crossing," Darcy said in a statement. The Army Corps says it intends to issue an Environmental Impact Statement with "full public input and analysis." At the site of the protests, the news spread in excited whispers and statements of disbelief. 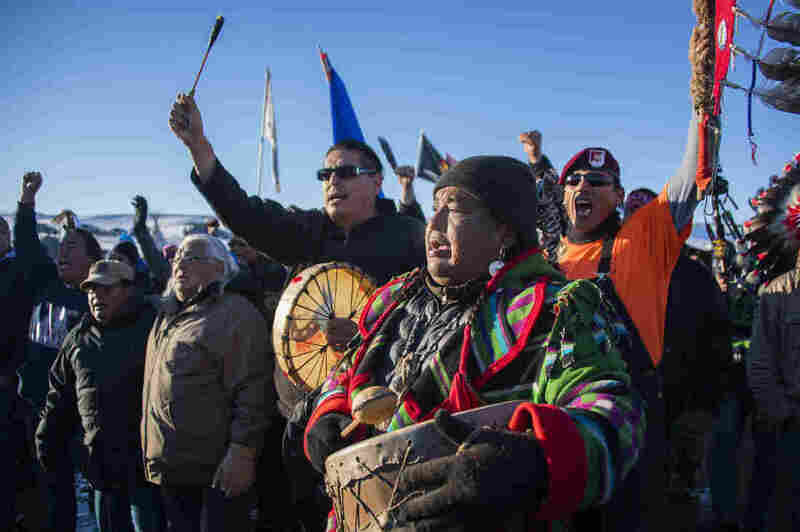 Finally, one man at the Oceti Sakowin Camp finally yelled it: "The easement has been denied!" Cheers and whoops erupted from the crowd nearby and continued for hours, as different parts of the sprawling camp heard about the federal government's decision. For Tom Shaving, of the Cheyenne River tribe, the news was exciting and a welcome relief. He has been camping in protest of the pipeline since August, watching his group of "water protectors" grow from dozens of people on the banks of the Cannonball River to a settlement of thousands. 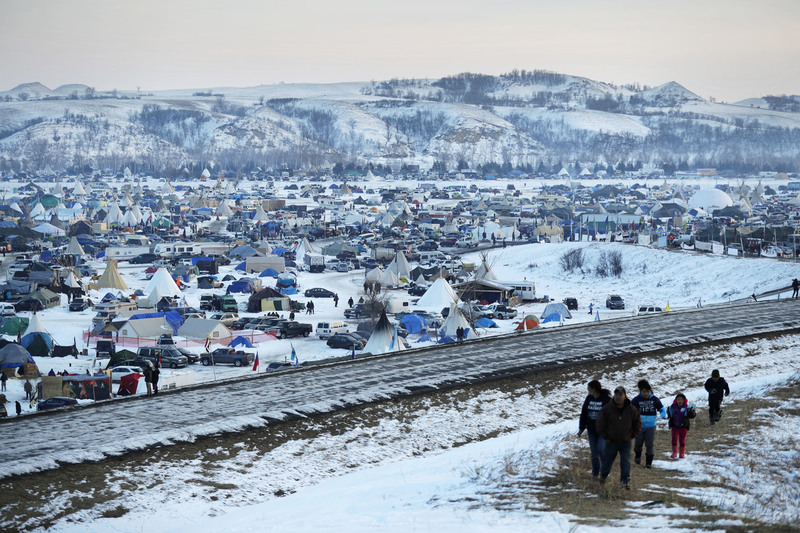 A view of the Oceti Sakowin Camp, north of the Cannonball River, where people have gathered to protest the Dakota Access Pipeline. In a statement, Standing Rock Sioux Tribal Chairman Dave Archambault II said the tribe welcomed the decision, but he also sounded a note of caution saying he hoped the incoming Donald Trump administration would "respect this decision and understand the complex process that led us to this point." "When it comes to infrastructure development in Indian Country and with respect to treaty lands, we must strive to work together to reach decisions that reflect the multifaceted considerations of tribes. Treaties are paramount law and must be respected, and we welcome dialogue on how to continue to honor that moving forward. We are not opposed to energy independence, economic development, or national security concerns but we must ensure that these decisions are made with the considerations of our Indigenous peoples." Shaving shares Archambault's caution, and he fears that a President Trump could undo Sunday's announcement. Like many at the camp, he isn't planning to leave. "We have to keep going," he says. "We have to persevere. Trump's right next in line." A previous version of this story said the Dakota Access Pipeline was to run about half a mile south of the Standing Rock Sioux Reservation. In fact, the intended route was north of the reservation.